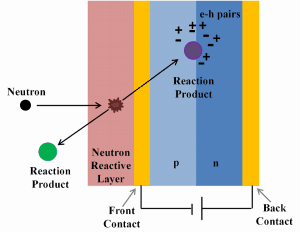 Indirect ionizing radiation consist of electrically neutral particles and therefore does not ionize matter directly. The bulk of the ionization effects are due to secondary ionizations. Detection of gamma radiation is very specific, because gamma rays interact differently with matter. Gamma rays can travel thousands of feet in air and can easily pass through various materials. Moreover, gamma rays can ionize atoms indirectly and directly (despite they are electrically neutral) through the photoelectric effect and the Compton effect. But secondary (indirect) ionization is much more significant. In order to describe principles of detection of gamma radiation, we have to understand the interaction of radiation with matter. Each type particle interacts in a different way, therefore we must describe interactions of gamma rays (radiation as a flow of these rays) separately. 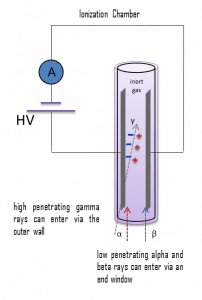 Gamma rays have very little trouble in penetrating the metal walls of the chamber. Therefore, ionization chambers may be used to detect gamma radiation and X-rays collectively known as photons, and for this the windowless tube is used. Ionization chambers have a good uniform response to radiation over a wide range of energies and are the preferred means of measuring high levels of gamma radiation. Some problems are caused by the fact, that alpha particles are more ionising than beta particles and than gamma rays, so more current is produced in the ionization chamber region by alpha than beta and gamma. Gamma rays deposit significantly lower amount of energy to the detector than other particles. The efficiency of the chamber can be further increased by the use of a high pressure gas. Typically a pressure of 8-10 atmospheres can be used, and various noble gases are employed. For example, high-pressure xenon (HPXe) ionization chambers are ideal for use in uncontrolled environments, as a detector’s response has been shown to be uniform over large temperature ranges (20–170°C). The higher pressure results in a greater gas density and thereby a greater chance of collision with the fill gas and ion-pair creation by incident gamma radiation. Because of the increased wall thickness required to withstand this high pressure, only gamma radiation can be detected. These detectors are used in survey meters and for environmental monitoring. 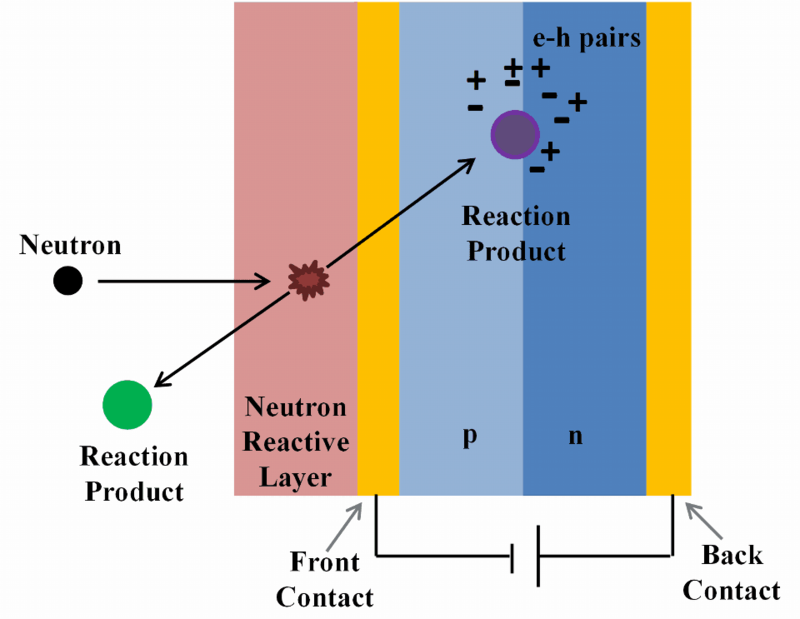 Detection of neutrons is very specific, since the neutrons are electrically neutral particles, thus they are mainly subject to strong nuclear forces but not to electric forces. Therefore neutrons are not directly ionizing and they have usually to be converted into charged particles before they can be detected. Generally every type of neutron detector must be equipped with converter (to convert neutron radiation to common detectable radiation) and one of the conventional radiation detectors (scintillation detector, gaseous detector, semiconductor detector, etc. ).